At the end we came to the conclusion that SVG is the best option to achieve a compelling combination of performance and “fun to work with”. Our NETRONIC Web Application Framework – nWAF for short – was born. With this Framework, we are now in a position of being able to very effectively develop interactive HTML5 Gantt charts. Let me start with some internal details. As mentioned above, nWAF is not a developer control with its own API and a documentation of 1,000+ pages that we hand over to our customers for developing their applications. Instead, it is a framework used by us to develop HTML5-based graphical planning boards for our customers. These customers can be other software developers as well as end users. In both cases, the nWAF takes up all graphical functionalities being needed for HTML5 Gantt charts within a web application. Gantt Library – It contains all the functionality that is needed for creating the Gantt chart. Within this library, we provide modules like a Gantt widget, a timescale widget, a module for calculating calendar data, a module for mapping dates to screen coordinates and vice versa (called time axis) and so on. App Tools – The App Tools cover all things not directly related to the Gantt chart, but nevertheless needed building a meaningful graphical planning board. The tooltip widget and the splitter widget are good samples for the App Tool’s content. Within this framework, the Gantt Widget obviously is the central component and of course it is well integrated with the other components to unleash its full value. So, from a developers’ standpoint: we are proud of the tools we build and hence happily “eat our own dog food”. 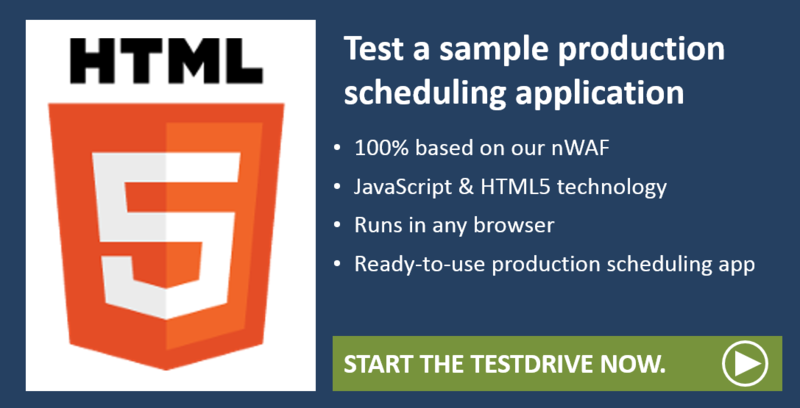 You may sense it: we believe that with the nWAF we can deliver an unprecedented visual scheduling experiences independent of the platform or the environment. As such, it will be delight building further products with it and basing further custom developments on it. And with any new development project, we will for sure add new functionality to the nWAF so that all other related products and apps will benefit from it. 1) You are a software developer looking for HTML5 Gantt charts functionality that can be integrated into your own web application. We decided not to sell nWAF as on own developer component like our conventional software controls. Instead, we are offering a very interesting cooperation model in which we want you to benefit from our 30+ years’ experience in developing interactive Gantt charts. With this approach, we jointly develop the nWAF based Gantt User Interface (GUI) for your application. The implementation of the business logic and the integration of the GUI into your existing software environment will remain in your responsibility. 2) You are a production planner or project manager looking for a tailor-made scheduling solution as addition to your current ERP system. This case is similar to case 1. Hence, see my remarks above. The only difference is that will also implement the data connection of the new application to your existing environment. 3) You are the owner of (or the responsible production planner in) a small job shop or a make-to-order company. You have no (or just a basic) ERP system and maintain your production schedule with Microsoft Excel or on a whiteboard. Good news: we will need no tailor-made development. All (or most) of what you might require is available “out-of-the-box”. Just visit just plan it and learn more. It is based on the nWAF described here, plus a scheduling engine on server side. 4) You are a Dynamics NAV partner or user looking for an interactive chart to manage your production data by using any of the NAV clients.